The wizarding world of J. K. Rowling has been generating quite a lot of interest in the LEGO community recently, in large part thanks to the recent revival of the official Harry Potter LEGO theme. 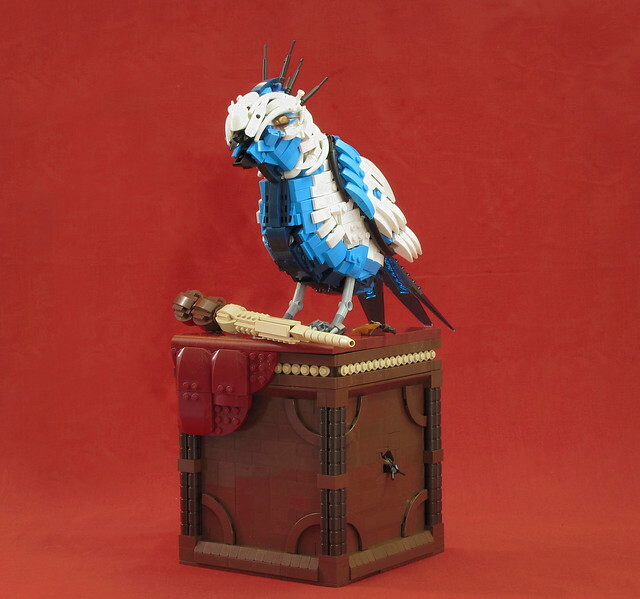 There have been many amazing creations and many contests dedicated to it (such as our own Microscale Magic contest), showing how popular the universe of Harry Potter and Fantastic Beasts is among LEGO fans. Revan New‘s latest creation is the winning entry to a contest on bricker.ru, the goal of which was to create a magical animal that does not exist in the books and movies, but very well could. The builder has obviously succeeded in making an animal that looks coherent with the fantasy of J. K. Rowling’s universe, but it is much more than that. The head of the bird is an intense mix of rounded parts representing feathers and the body is full of wedge plates and slopes to get this same effect of feathers and colour patterns. A nice little detail is translucent fins used as tail feathers, giving the bird a truly magical feel. But Revan New does not stop there. He adds a little stand for his wavebird complete with velvet and a magic wand.